This item is not available for purchase online. Please call (918) 970-4069 to order. The magical combination of tremolo and reverb is the earliest example of a perfect guitar effects marriage. First pioneered within historic amplifiers of the 1960s, this harmonious coexistence has made it’s way onto countless records and performances—from early surf, swampy bayou blues, spaghetti westerns, film noir soundtracks, to modern day indie rock. There are certain things in life that just belong together—the blend of tremolo and reverb create the perfect pair. 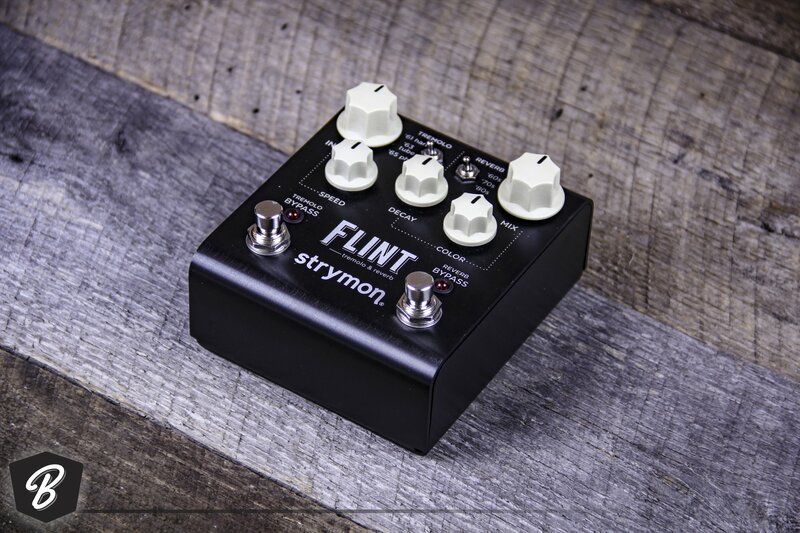 Flint gives you the soothing, pulsating, and hypnotic effects that were pioneered in vintage amplifier tremolo circuits, along with three classic and completely unique reverb algorithms. You get the sonically complex ’61 Harmonic Tremolo, the swampy and sultry ’63 Power Tube Tremolo, and the sharp and balanced ’65 Photocell Tremolo. You also get the classic ’60s Spring Tank Reverb, the inventive ’70s Electronic Plate Reverb, and the nostalgic ’80s Hall Rack Reverb.